Dwayne the Rock Johnson stars as Joe Kingman, a quarterback for a Boston-based football team who has the perfect life or so he thought. Living the high life as a bachelor, Joe or “The King” is rich and famous and when a young girl, Peyton (Madison Pettis) turns up at his door step, stating that she is his daughter, his dream life suddenly shatters. For Joe, this is the worst time that this could happen as he is opening up a new restaurant and is hoping to gain a world championship ring with his team that has eluded him for years. Dubbed a “bad parent” for leaving his daughter behind at his restaurant opening, Stella (Kyra Sedgwick), his agent goes into damage control and turns this “bad parent” into “#1 dad”. 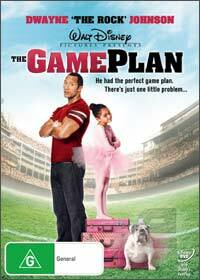 The star of the movie is Madison and Dwayne who bounce of each other quite well, especially when former wrestling star “The Rock” performs ballet with his daughter as his team watches on...classic stuff. The comedy of The Game Plan is perfect for all ages and even contains a few curve balls for the older adults that children will not get. It’s amazing and interesting to see how Disney have changed as society’s norms are changed, yet they continue to release great family movies but at the end of the day, this feel good movie is predictable but is still enjoyable and contains some great moving scenes from laughs to tears. The disc also features some great special features from interesting featurettes to a great bloopers reel with Marv Albert which rounds this DVD up nicely. Great video quality and decent audio quality, there is little to complain about The Game Plan.